This story is from the January 1999 issue of Motocross Action Magazine. Engine: Water-cooled, 249cc, two-stroke, reed-valved engine. Bore and stroke: 66.4mm by 72mm. Those are the tech specs, but these are the questions that most riders want the answers to. QUESTION ONE: IS THE ‘99 ENGINE FAST? You bet! Suzuki has resurrected itself from the ashes of the rather mediocre ‘98 engine. The ‘99 powerband starts down low, turns over with a light feel and snaps through a very solid low-to-midrange spread. There is no hesitation with the RM engine. It is very responsive and the power is well situated. In fact, it is a KX250-clone powerband. Well, that’s not exactly true–what the KX does just off idle the RM does higher up in the rpm range. Although it is torquier down low than previous RM250’s, it’s not a grunt engine. Where the KX250 churns out the power with tractor-like efficiency, the RM250 whips through it with the sensation of a bike with very light flywheels. QUESTION TWO: IS THE ‘99 ENGINE BETTER THAN THE ‘98? Leaps and bounds better. Last year’s RM250 engine was not the fastest thing on two wheels. It had a nice, pleasant, manageable and well-placed powerband, but gave up gobs of power to the KX and CR. But not it ‘99. No more Mr. Nice Guy for Suzuki. The ‘99 engine doesn’t give up a single iota of power to the competition. It makes serious ponies, makes them in a sweet spot on the curve and makes the RM250 an instant winner. QUESTION THREE: WHAT DID SUZUKI DO TO THE ‘99 ENGINE? Obviously, the first thing Suzuki did was buy a ‘98 Kawasaki KX250 and take it apart. Then, they built a clone, copy, replica, reproduction, facsimile, or whatever you want to call it. The ‘99 RM250 engine borrows heavily from the ‘98 Kawasaki. Smart move. Kawasaki has the juice–Suzuki wanted it. So they went to the source. Here is a list of changes that Suzuki made to their engine for ‘99. (1) The exhaust port timing and shape have been changed for more midrange. (2) Suzuki modified its crankcases for increased durability and decreased the flywheel inertia that it increased in ‘98. (3) A 38mm Keihin PWK Power Jet carb (which is identical to last year’s–although Suzuki does claim that the spray bars provide better misting). (4) Radiator capacity has been increased by two rows for improved cooling. Extra-large radiator wings, with more surface area and wider breadth, have been added to draw more air into the radiators. (5) A new domed piston replaces last year’s flat-top model. The new piston gets the same black Fluoro-compound surface treatment that the RM125 piston receives. (6) The power valve mechanism has been improved to make opening and closing more consistent. Additionally, a new power valve cover increases exhaust resonance volume. (7) The silencer end cap gets the almost universal enclosed treatment (like the KX and YZ). QUESTION FOUR: WHAT DO THE CHANGES MEAN? Where the Kawasaki churns its power out with a growling, snarling and gnawing feel, the Suzuki whips through it with a feathery touch. Where the KX250 has roll-on power (right off idle), the RM has light switch power (in the middle). Don’t get us wrong, the RM isn’t gumming the ground that the KX chews up. Far from it. The RM has a stirring powerband. It’s snappier, quicker revving and more hyperactive than the KX, but not as tractable, hooked up or torquey. 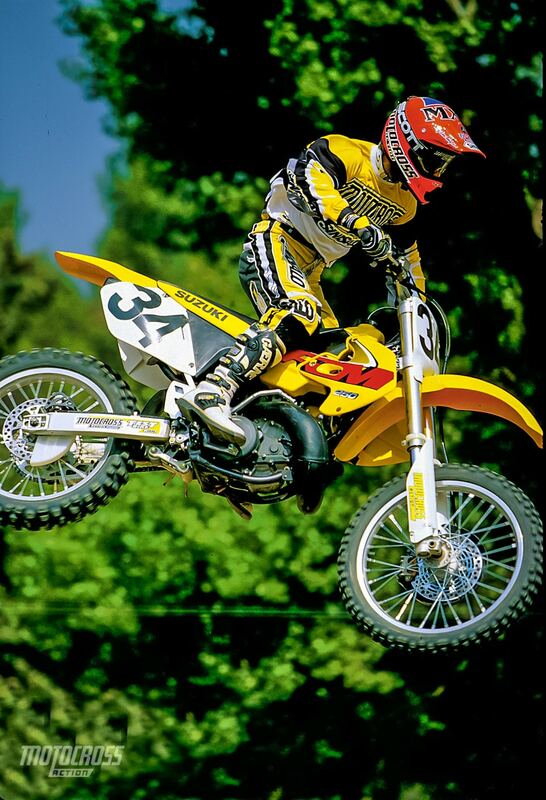 The 1999 Suzuki RM250 engine was head over heals improved over the 1998 RM250 engine. QUESTION FIVE: HOW GOOD IS THE ‘99 ENGINE? Pundits will soon be calling 1999 the “Year of the Engine.” Every manufacturer, save one, improved their power plant significantly. Honda, unfortunately, in trying to bring their power down into the midrange, gave up their best attribute–pulling power. However, in the winners’ column: (1) KTM took up Honda’s slack by making a mid-to-top engine that rockets down straights with the best over-rev out there. (2) Yamaha redesigned their venerable YZ250 engine (in the image of a ‘96 CR250) and hit pay dirt with a broad, well-placed and effective arm stretcher. (3) Kawasaki didn’t have to do anything to their classic powerband to earn plaudits, but they went ahead and massaged the powerband across a wider duration. (4) Suzuki joined the fray for the first time since ‘96 (when they had a Honda clone engine) with a potent midrange KX clone. Paradoxically, Suzuki got the midrange powerband that Honda was looking for in ‘99. There is something for everybody on the showroom floors in ‘99. In the case of the Suzuki, it’s a jazzed up, pill popping, midrange, hyperactive KX engine. Note: The RM250 is very rich. The first step to getting it to run clean is to drop the main from 158 to 152. We also lowered the pilot, but some conditions may not require this (turning the air screw out to two turns could clean up the very bottom). QUESTION SEVEN: HOW GOOD IS THE GEARING? If you are able to carry your speed, race on fast tracks or are prone to over-rev, the stock gearing is in the ballpark. For tighter tracks, slower riders or short-shifters, drop the 48 tooth rear for a 49. QUESTION EIGHT: WHAT ABOUT THE REAR SUSPENSION? For the last two years (‘97-’98) Suzuki has missed the shock valving by a country mile. Thanks to excessive compression damping it was jolting, abusive, rigid and harsh. 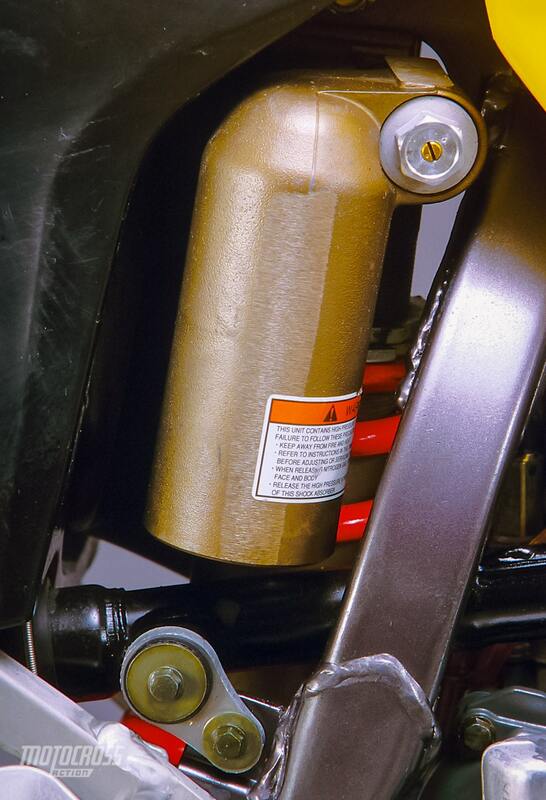 The ‘99 RM250 rear suspension doesn’t have to improve much to be better than what Suzuki hammered riders with in ‘98. That said, Suzuki missed by a country mile in ‘99 too. At least this time they missed it by a mile in the other direction. Instead of making it too stiff they opted for too soft. Suzuki kept the identical linkage ratio, but to avoid last year’s harshness problem they lightened the compression damping and ordered up a progressive rate shock spring. The wispy compression and multi-rate spring aren’t up to the task (unless the job at hand is leaving black streaks of rubber on the underside of the rear fender). 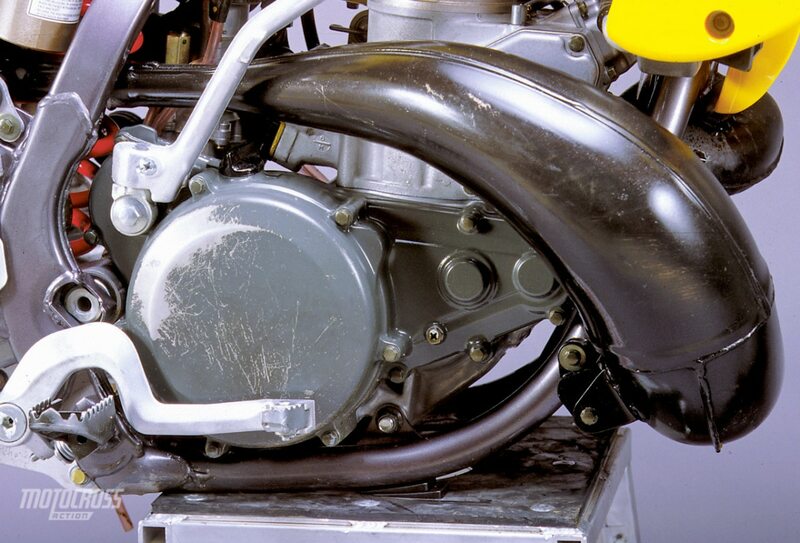 In simple English, the rear of the ‘99 RM250 is a marshmallow–a very soft marshmallow. The only way to fix it is to dump the stupid 4.9/5.6/6.5 kg/mm progressive shock spring for something stiffer (and straight-rate). What was our best setting? Notes: Neither Suzuki nor Kawasaki have grasped the uselessness of progressive rate springs. Motocross racers do not want a bike that wallows in the first half of its travel–only to bottom out at the end of the stroke. Give us straight-rate springs and we will compensate with sag, clickers and prayer. QUESTION NINE: HOW GOOD ARE THE NEW FORKS? For the first 11-inches of travel the 49mm upside-down, Twin Chamber Showa forks are very good. Unfortunately, the RM250 has 12-inches of travel. That last inch is a clanging, banging, mangling mess. The first thing we did was add 10mm of oil to each fork leg. Higher oil level is the simplest solution to fork bottoming. It should be noted that we liked the feel of the Showa forks on small and mid-sized bumps–but couldn’t stop them from bottoming regardless of how far in we turned the compression clicker. Unfortunately, raising the oil height from 204mm to 194mm did absolutely nothing. The only solution was a stiffer fork spring (in conjunction with the high oil height). We swapped the stock 0.42 springs for 0.43s. QUESTION TEN: WHAT ARE THE BEST FORKS SETTINGS? Notes: We had this same blow-through problem with the RM125 forks (we put the stock RM250 0.42 fork spring in it). The 1999 RM250 in action. QUESTION 11: HOW DOES IT HANDLE? With the stock suspension settings, it doesn’t handle–it wallows. But once you stiffen up the front and rear the RM250 begins to deliver its fabled and infamous traits. Which is which? The cornering, jumping and directional changes are fabled. The twitching, bucking and straight line inaccuracy are infamous. Although Suzuki bolted-on upside-down forks and a revalved shock, there are no other significant chassis changes. The geometry remains as it was and probably evermore shall be. That means that this is the ultimate bike to ride on a tight twisty track. It turns tighter than any bike made (quicker than many 125s). It launches into the air with a light, airy, feathery feel (the ultimate whip-it machine). It snaps off S-turns, directional changes and tight berms with knife-blade sharpness (its turning radius is unbelievable). 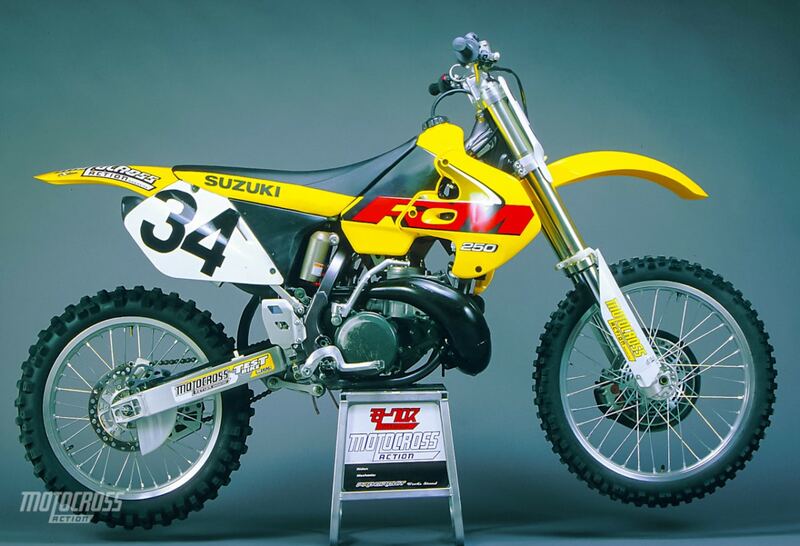 For a rider who specializes in jammin, crammin’ and hammerin’, the Suzuki RM250 is sweet. On the flip side, the RM isn’t the optimum high-speed racer. The chassis doesn’t like whoops, high-speed straights, squared-edge bumps or sweeping corners. It slaughters any sense of security by missing the preferred line at the end of rough straights by feet–not inches. QUESTION 12: WHAT DID WE HATE? (1) Radiator wings: We thought the ultra-wide wings would interfere with our legs (by spreading them out as we rode), but they didn’t. They did collide with our aesthetic sensibilities, though. The red on yellow decals are an acquired taste (and they say “ROM” instead of “RM”). (2) Bars: Very weak handlebars. (3) Shifting: We leave the RM250 in gear when we put it up on the bike stand. Why? Because we can never find neutral. (4) Noise: Lots of engine clatter. (5) Kickstarter: It sticks down. The back of the lever rubs against a rather ghastly weld on the frame. We filed the glob of weld off to free the kickstarter. (6) Rear brakes: The rear brake is touchy–too sensitive. Suzuki used a 20mm larger rear rotor, which we thought would modulate better, but we were wrong. (7) Clutch: Suzuki clutches always run right on the verge of perpetual slip. Don’t abuse the clutch or the drive will go soft. Expect to replace the clutch basket at regular intervals (it notches faster than Wyatt Earp’s pistol grip). The shift shaft mushrooms at the end after a few rides, causing the bike to lurch in first gear. (8) Spring rates: We hate progressive rate springs (which Suzuki spec’ed on the rear). Both the front and rear of the RM are too soft. The stock RM250 handlebars were very weak. A gentle tip over would cause them to bend. QUESTION 13: WHAT DID WE LIKE? (1) Grips: Suzuki has great grips. Not too firm and not too soft. (2) Tires: Sneakers are a Bridgestone M77/78 combo. Good intermediate tires. (3) Front brake: Suzuki didn’t mess with the front brake like they did the rear. The front brake is still second only to Honda’s when it comes to power. (4) Power: Nobody is complaining about the RM’s new low-to-mid powerband. It rocks. (5) Fork adjusters: We make ten compression adjustments for every rebound change. 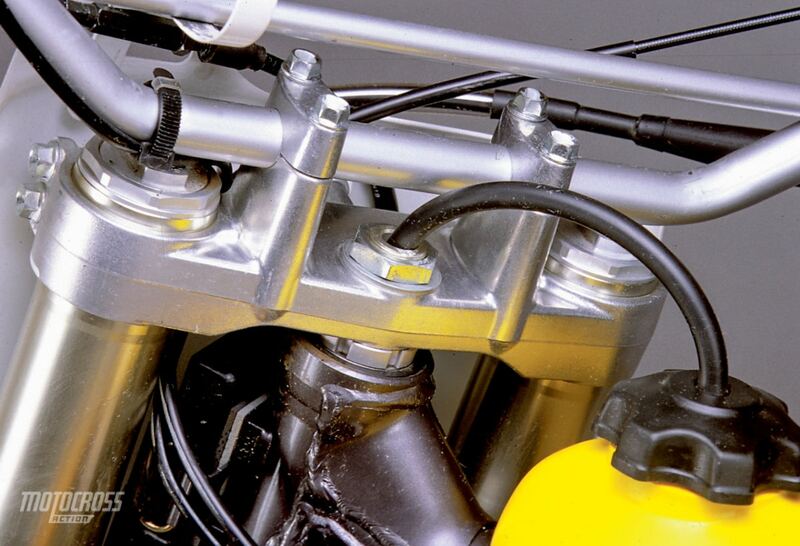 The Showa Twin Chamber forks have the compression clickers on top. That makes life easier when you are in a hurry. (6) Shock adjusters: The shock’s rebound adjuster can be reached without having a friend press down on the rear of the bike. (7) Ergonomics: Comfort means a lot, and Suzuki’s got it down pat. The RM250 is comfy. QUESTION 14: WHAT DO WE REALLY THINK? Engine: Kawasaki has the perfect motocross engine. 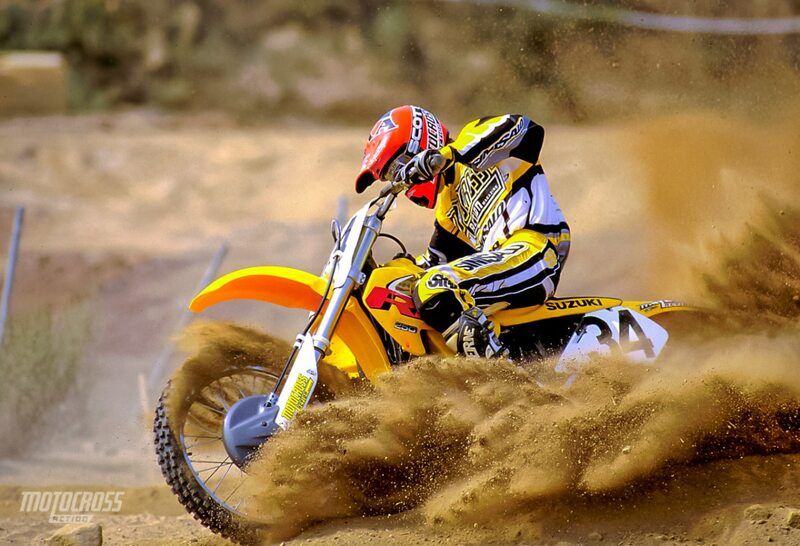 Suzuki has 85 percent of a perfect motocross engine. Handling: You either love it or you hate it. We love it on supercross-style tracks and hate it on high-speed tracks. Suspension: Be careful when you roll this bike out of the showroom. It may bottom out on the door sill. Overall rating: The ‘98 Suzuki RM250 was slow, harsh, twitchy and unreliable. The ‘98 RM was not much of a foundation to build on–so Suzuki used Kawasaki’s instead. Very smart. The verdict? A great engine in a responsive frame with fixable suspension.